Composite Output Index at 45.9 (46.7 in April). 35-month low. Flash Eurozone Services PMI Activity Index at 46.5 (46.9 in April). 7-month low. 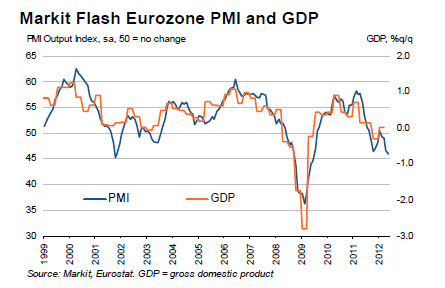 Flash Eurozone Manufacturing PMI at 45.0 (45.9 in April). 35-month low. Flash Eurozone Manufacturing PMI Output Indexat 44.7 (46.1 in April). 35-month low. Activity fell at the fastest rates for seven months in services (and the second-fastest in 34 months), while manufacturing production dropped at the steepest rate since June 2009. The goods-producing sector posted the stronger overall rate of contraction. Incoming new business in the Eurozone private sector declined for the tenth successive month in May. Moreover, the pace of contraction was the fastest over this sequence, and the strongest since June 2009. Manufacturers continued to post a steeper drop in new orders than their service sector counterparts. France posted a steeper drop in new business than Germany, while the rest of the Eurozone continued to see a stronger average rate of decline than the ‘big-two’. Reflective of the sustained fall in new workloads, private sector firms in the Eurozone continued to post declining outstanding business mid-way through Q2. The rate of decline was little-changed from April’s 33-month record. By sector, manufacturing and services registered broadly similar rates of contraction. The ‘big-two’ both posted weaker falls in backlogs than the rest of the Eurozone. Private sector employment in the Eurozone declined for the fifth successive month in May. The rate of job shedding was close to April’s 26-month record, but modest overall. This reflected a return to workforce growth in Germany, albeit at a marginal rate. Jobs were cut for the third month running in France, and for the twelfth consecutive month outside the ‘big-two’ on average. Commenting on the flash PMI data, Chris Williamson, Chief Economist at Markit said: “The flash PMI indicated that the Eurozone downturn gathered further momentum in May, with business activity and new orders both falling at the fastest rates for just under three years. “The survey is broadly consistent with gross domestic product falling by at least 0.5% across the region in the second quarter, as an increasingly steep downturn in the periphery infects both France and Germany. Europe is in a full-blown recession and for the first time in about a year we did not see any Pollyanna comments from Markit economists. Perhaps the news has sunk in that as I have repeatedly said, this recession will be long and deep and Germany would not escape. All GDP estimates from the Eurozone to-date have been pure bunk. Expect numerous downgrades after this disastrous report. If countries are to meet debt-to-GDP targets still more austerity measures will be forthcoming which will mean more layoffs, higher unemployment, and lower revenues. In short, Spain, France, Italy will find it impossible to meet budget targets as the recession picks up steam.